« How to ruin a very good site reputation ! Ok … enough babbling about my experience. It is actually very simple to use SysPrep. First setup a virtual machine that you want to use as a base image for all other VMs in future. Located sysprep.exe at C:\Windows\System32\Sysprep. Start exe and you should see a very simple form which has only three options … “System Cleanup Action” , “Generalize” and “Shutdown Options”. Since we want to use this image to create new system, select “Enter System Out-Of-Box Experience” (OOBE) … check “Generalize” check box and select “Shutdown” in Shutdown options. Once that is done, machine will shutdown … and save this whole virtual machine to be used as a base machine. As a side note, once I did that and used those VMs to re-setup domain … I was able to create 2 node active-passive cluster without any issue … yayy … … But I guess, I will post that “How To” some other time because I think it will take more than one post … because honestly, I really had hard time finding steps about setting up whole thing … and none of posts had everything from beginning to end (from creating VM … to setting up domain …. to setting up network … to setting up shared storage for Cluster … to setting/configuring clusters). So I wanted to combine everything and create a series of posts to I can (and others too) can see them at one place. 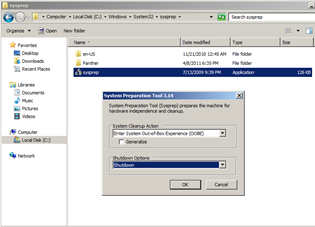 This entry was posted by Gaurang on February 23, 2013 at 10:38 am, and is filed under How To, Virtualization, Windows. Follow any responses to this post through RSS 2.0. You can leave a response or trackback from your own site.